Toyota and Southern California have been linked since the brand’s very first days in the USA in the late 1950s. The first Toyota dealership in America was located in Hollywood and after that would come the company’s massive American headquarters in the city of Torrance. For decades Toyota’s operations have been a major player in the Southern California car industry. But that’s all about to change. Last week, the company announced plans to move much of its US operations to Texas to take advantage of that state’s business-friendly policies. While the move to Texas makes compete sense from a business standpoint, Toyota’s large presence in Southern California will be sorely missed. 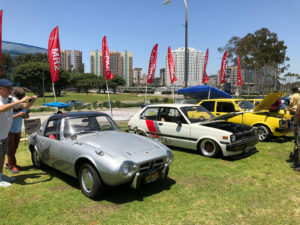 For decades LA has been an epicenter of Toyota enthusiasts – and nowhere is that more evident than at Toyotafest in Long Beach. It just so happens that Toyotafest 2014 was held just days after Toyota announced the move to Texas, and there certainly seemed to be a strange aura around this year’s show. But at the same time, it was also comforting. Because while Toyota’s corporate operations might be packing up and heading off for greener pastures, the passion for the brand in SoCal shows no signs of fading. In typical LA fashion, the weather for this year’s event couldn’t have been better. If anything, it was actually a little on the hot side with a mid-summer feeling despite the fact that we are just a couple days into May. Sunshine and Toyota: two Southern California institutions. I consider Toyotafest one of the most enjoyable events on the yearly calendar, and regardless of the fact that it’s limited only to Toyota, Lexus and Scion-branded vehicles – it has one of the most diverse lineups of any car show I’ve been to. Spread among the grass near the world famous Queen Mary, you’ll find everything from lifted Land Cruisers and slammed Scions to immaculately restored Celicas. Enthusiasts of all types have been gathering in the SoCal sun for 19 years now to celebrate their love of Toyota. While I’ve covered Toyotafest several times, it seems that every year there’s a bunch of cool cars that I’ve never seen before. Sure, there are plenty of familiar ones, but it’s always impressive to see just how many Toyota maniacs come out of the woodwork for this event. Look for more on my favorite cars from the show in an upcoming spotlight selection. For several years you could say that Toyotafest didn’t offer much by way of modern cars to be excited about. But now that the Scion FR-S has been around for a bit, the contemporary side of the Toyota community is alive and well. Who cares if the engines say ‘Subaru’ on them? Even with the popularity of the FR-S you still only see them on the roads occasionally, so it was cool to see so many in one place and all showing different degrees of modification. While Toyota’s large presence in SoCal will certainly be missed when the company moves to Texas, the memories and passion of local enthusiasts aren’t going anywhere. See you at Toyotafest 2015! The Toyota Owner’s and Restorer’s Club, established in 1995, is an organization aimed at the enthusiast of all Toyota automobiles. T.O.R.C welcomes owners, drivers, and enthusiasts of all Toyota brands, including Lexus & Scion.